Since I had a community function to do at work on Saturday, I ended up with a Monday off, and I wanted to try and do something real quick in the morning before spending the day with my family. I needed something that was close by, and could be shot with low clouds. My original thought was a barn that was out near Union Cross that I had shot a few times before. I had gone out to get it for a sunrise in the early Spring, but that didn't pan out because there was an enclosed semi trailer backed up to the door. 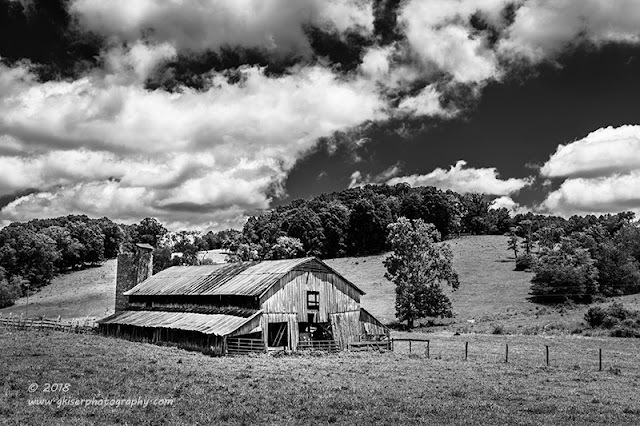 This time I wasn't planning on any color in the sky, and was actually looking forward to deep clouds, and possibly a light fog over the barn. I was going to shoot this as black and white to accentuate the mood I was going for. When I arrived at the barn, it was shortly before sunrise and I could tell that the clouds were not as low as I was hoping. In fact, there was no definition at all in the sky, and the lighting on the bar was not good at all for how the scene was developing. Instead of waiting there, I decided to abandon that idea and move out to Walnut Cove to see what was at my favorite restoration shop. The last time I was out there there were a couple of Edsels which caught my eye and I thought with the diffused lighting of the cloudy morning I could so some more work with them. As I was traveling down the road, I looked over to the left and saw a blue Chevy truck parked up against another shop with a white brick wall. The framing on the window was blue and it matched the truck. The lighting wasn't right for the shot just yet, so I continued on my way to my "plan B" destination. When I got there, one of the Edsels was gone, and there wasn't anything particularly that was jumping out at me. It was also starting to drizzle a little bit. I was starting to feel beat down at this point. I had gotten up early, and was driving around for what appeared to be nothing at all. I started on my way home, but I wanted to check out that one blue truck as I went past it. When I arrived at the shop, the lighting was a good deal better with the sun fully up. It was still very diffused thanks to the clouds, but the clouds had brought a steady mist. It wasn't enough to really hamper any photography so I pulled off into the side lot and grabbed the camera. I fitted my 24-70mm lens for the simple fact that I was going to need to be in the 50mm range for this shot. There was a newer Dodge pickup parked just to the side of the old Chevy that I wanted to avoid. There was also a bunch of junk on the side of the building. Had I gone any wider than 50mm, I would have been including too much of this. On the other end, I wanted to include the window that was on the side of the shop since it matched the truck and provided a very nice visual balance to the scene. Shooting with my long lens would have isolated the truck, but would have missed much of the window, and flattened the truck too much. I also wanted to saturate the colors and remove glare, so I added my Color Combo Polarizer. I went ahead and started to frame up shots, and quickly realized that it was starting to rain pretty hard. It was hard enough that I was going to have to abandon this location rather quickly. I moved in close and opened the field of view up a bit and was able to grab this shot which I though was one of the best out of the six frames I was able to get. After getting this shot, it was time to head to the house. The rain was just too much for me to deal with. When I got home and started to look through the images, I realized that the water on the truck actually worked to take some of the high gloss out of the equation. Since I was used to working with non-reflective surfaces, I liked how the water added a touch of texture to the shiny bits. 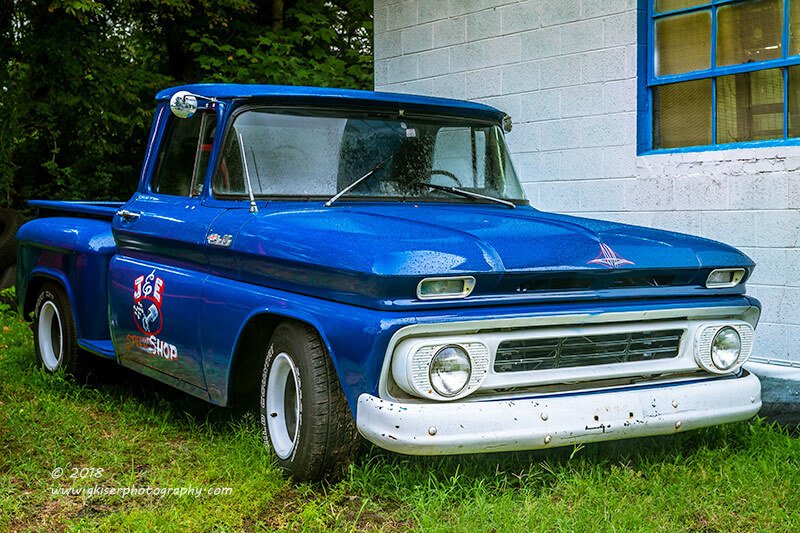 The blue in the window frame mimicked the blue paint just like I had seen in the early morning hours and the white wall of the building complimented the bumper and grill on this this truck. While going through my images, one of the first ones that I shot also caught my eye. It wasn't the color of the scene like in the previous one though. This one just had a certain feel to it that I liked, but it deserved a different treatment. I actually started by converting it to a black and white image. I worked on the tonal relationships and did some dodging and burning here and there before I really started to like how this one looked. I added a touch of grain to the image as well to give it a bit of a dated look, without going overboard on it. The key parts to this image are the door art, and the window once again which provides a nice visual balance to the whole composition. My morning certainly didn't go as planned, and I didn't even get my intended barn shot at all. I was able to find a truck that I had not seen before, and was lucky enough that it was in a setting that really fit it. I would like to go back another time to see if I can shoot it in different light, but I have a feeling that this was a fleeting chance to capture this truck, and had I not been out looking for that "plan B", I would have missed the opportunity to capture it at all. It might not have been the morning I was expecting, but some good did come from it. 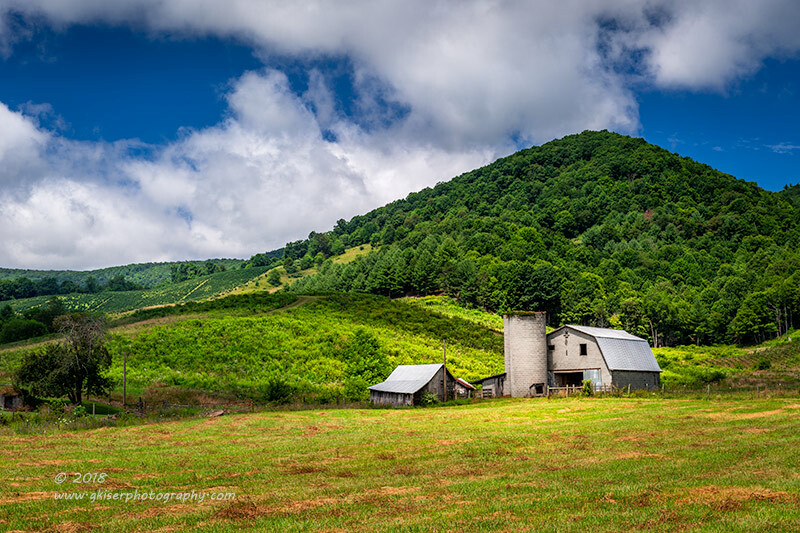 As you might recall, last week I found myself in Virginia after a quick planned shoot in Sparta, NC. I have to admit, I really enjoyed my time there and was wanting to go back and do some more exploring. As luck would have it, I actually had the time to go out and do some of that exploring this morning. It was kind of a complex decision, and one that really started out backfiring on me. So, here is now this all went down. My week had been pretty much taken up with planning for my webinar with Singh-Ray which dealt with my Wabi-sabi style of photography. That meant that for pretty much the whole week, I was working on my presentation and reviewing lots of images from my rural explorations. I had some mixed feelings about this. On one hand I was getting tired of seeing rust, but on the other hand, I was really studying my style and was really in tune with how my images were looking. On Friday, at 9:15pm, my webinar was over and I closed out of the presentation program with a complete sigh of relief. I was now able to focus on where I wanted to go on Saturday, and it was the first time I had given it any thought at all. I looked at the weather and saw that sunrise wasn't going to look all that great here or in the mountains. There were chances of storms and rain through the early morning hours, and then sporadic clouds for most of the morning. The clouds would increase throughout the day. 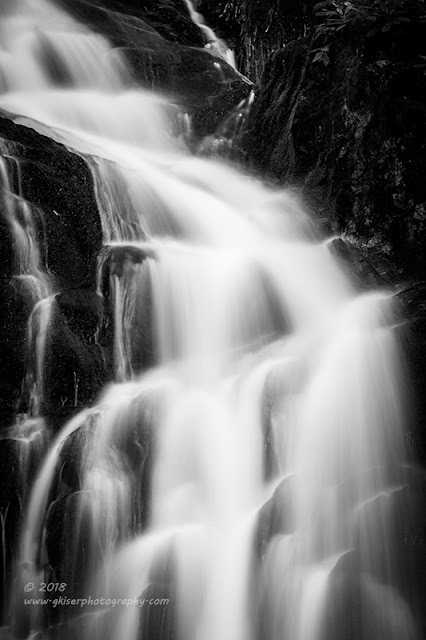 I was wanting to do some more waterfall work, but the lack of clouds in the morning would have been problematic. 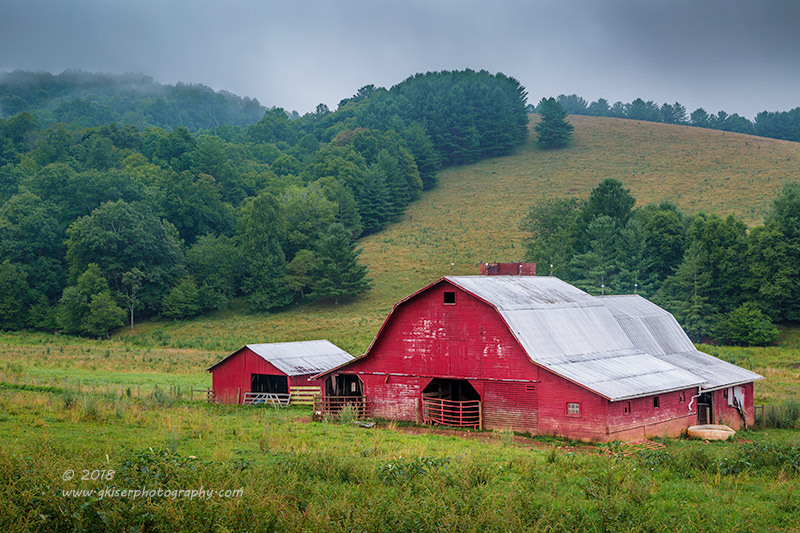 With the intermittent cloud cover, I thought that my best option would be to do either some landscape work in the mountains, or some barn photography. I wasn't really up to doing landscapes after a week of looking at specific subjects, so I figured that I would do some rural explorations. I might as well go to Virginia, and if I was going there, I might as well reshoot a scene from several years ago off of Hwy 52 in Cana, VA.
Just in case, I set my clock for 3:30am so that I could actually get up and to the mountains if the sunrise would be worth it. It was after 10 when I went to bed, so when the alarm rang at ungodly thirty, I was not overly happy. I looked at the weather, and the sunrise forecast was still looking rather dismal. The clouds were absent here at the house, but showed to be partly cloudy in the mountains. That was a far cry from rain and storms, but I was too sleepy to really care. I decided to forgo sunrise, and get another hour of sleep before getting up. Well, the further North I traveled, the more clouds I started to see. This was no problem and it was actually welcomed since there was really good definition in them from what I could see. However, as I climbed altitude I got closer and closer to the clouds and ultimately found myself driving through them. I don't mind working with fog so I was still happy with the turn of events. When I got to Cana, I took one more kick to my stomach though. The cars that I was there to shoot had been moved around a little bit, and the trees had overgrown most of them. The shots that I was wanting to do were no longer possible. With the flog, and now drizzle, I decided it wasn't worth going through the overgrown field to get close to the cars which were most obscured by the trees. Oh well, I was out here to explore, and that was what I was going to do. I worked my way North and then West. I found myself crossing the Blue Ridge Parkway, but I only knew it by the GPS in the dash. I had absolutely no visibility, and I knew that the Parkway would be just as bad. I needed to loose altitude if I was going to have a chance of finding something to shoot this morning. I made my way towards Galax, VA on some road that was paved and had yellow lines (that was about all I knew). I would pass barns that were moderately interesting, but in the current conditions they were not worth me pulling over. I was starting to get rather discouraged at my progress at this point. I remember thinking to myself I should have brought my tall boots and just done waterfalls. The weather was perfect for that, but I was woefully unprepared for standing in the water. Just as I was starting to panic a little that I wasn't going to find anything, I passed by a red barn sitting at the base of a hill. The barn was really pretty, and the hill had a lot of character. The sky was really less than ideal though. But...it was something and the red of the barn would pull the attention away from the sky pretty well. I got turned around and pulled off of the road on the gravel shoulder. I pulled the camera out and set it up with my 24-70mm lens and a Singh-Ray Color Combo Polarizer. The property was gated, so I wasn't able to get in close, but the barn was relatively close to the road, so that wasn't a huge deal. It just limited my compositional choices. I framed the barn several different ways both including the sky and excluding it. I didn't have much hope for the shots with the sky in it, but the histogram was showing that nothing was blowing out at least. I was really figuring that my money shot here was going to be the barn isolated on the hillside, omitting the sky entirely. I was happy to find out when I was gong through the images that I was able to pull in some detail in the sky which worked with the composition. I was really fortunate since when I was shooting these, I was seriously thinking that they would all be trashed when I got home. That was not a fun thought since it was looking like this was going to be my only subject for the day. The rain was increasing at this point. I was here, and I had the whole day to ride around. I might as well make the best use of it. I continued to drive around for the next two hours touring small towns, long country roads, and getting chased by dogs. It was starting to remind me of my cycling days, and I was getting pretty bored driving around. I started to explore those narrow, winding roads that may or may not lead somewhere. 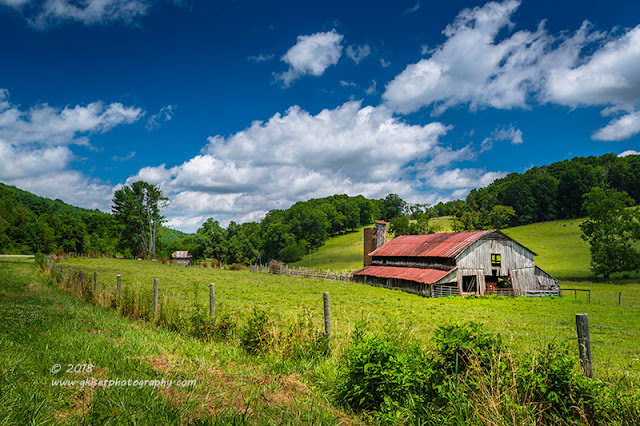 I found a bunch of barns that I would have liked to worked with, but there was nowhere to pull off of the road, and if I had, there is a good chance I would have caused a traffic issue in the event somebody else wanted to come down the road. Just as I was about to give up, I happened to see a truck surrounded by weeds well behind a house somewhere near Independence, VA. At this point I was getting desperate for something worthwhile to shoot. 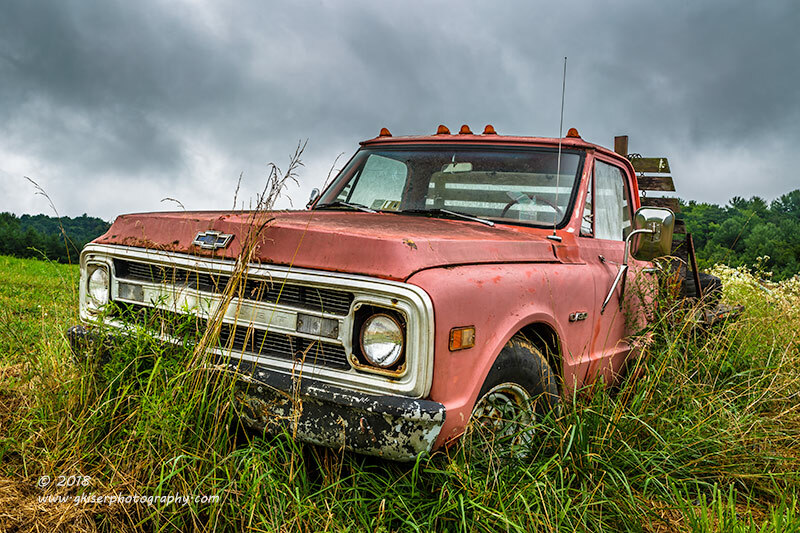 Looking at how the property was, there was no way to shoot this from the road, so I was going to have to get permission from the owner to go and play the truck. I pulled onto the long driveway passed the barn, and finally up to the house. I got out of the 4Runner and approached the house. The windows were open, and there was a car to the side of the house which indicated I might get lucky and find somebody there. I knocked and rang the bell...and waited. I heard nothing on the inside of the house and backed away from the door to give myself a view around the side of the house. As if planned, as I was backing up, I saw a gentleman approaching with a concerned look on his face. I explained why I was there, and what I wanted to do. He looked less concerned at this point and more confused. He wasn't really sure why I would want to take a picture of an old rusting truck, but he seemed to believe my intentions were legitimate. He said that I was free to help myself and I couldn't hurt anything. That worked for me! I got the camera out and decided since there was a little clutter around the truck on one side I would fit my 70-200mm lens to better isolate the truck. It also served the purpose of cropping out the sky which was pretty boring at this point. I set up a few compositions and grabbed a few shots before the property owner started to walk up the hill towards me. We actually chatted a few minute about the truck, and I found out that it was originally a Nebraska truck and his son had bought it with the intentions of restoring it. However, he has quite a few projects and it has been left to sit there. It is for sale, and if anyone is interested, I do have contact information. After we talked I noticed that the sky had changed significantly. There was detail in the clouds now, and that was a very good thing. I swapped out lenses for my 24-70mm, and moved the Color Combo Polarizer from the long lens over to this lens. Now the compositions were coming much easier. Something that I hadn't seen from the road was another Chevy truck parked behind the first one I saw. This was a flatbed, and while it didn't have a lot of rust, it still showed a great deal of weathering in the finish, and I thought that it would make for a pretty good shot as well. The clouds were really nice behind it, so I was able to get in close and go wide to get a good portion of the sky behind the truck. 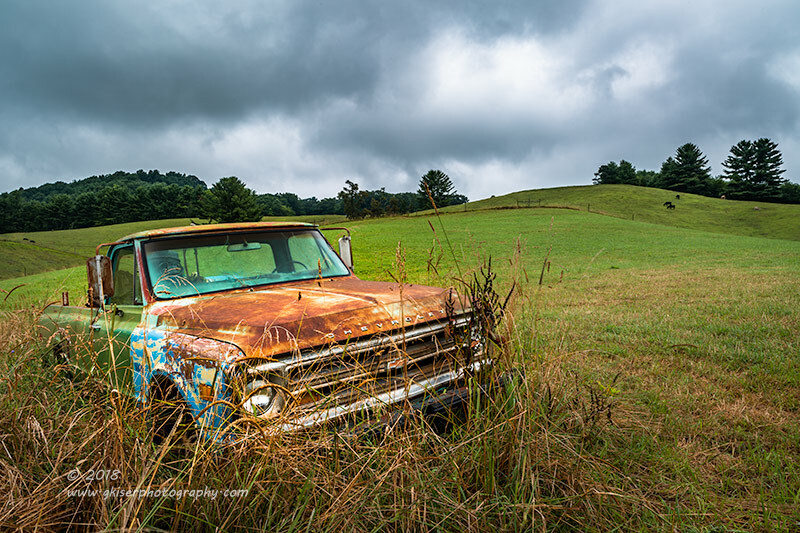 While I wasn't wild about the color of the truck, it seemed to work very well with the greens and subtle blues in the clouds. It wasn't my normal patina, but the final execution was something that I was pretty happy with. I didn't work much with this truck since the color wasn't the best. I only shot a handful of exposures and a couple of different compositions before moving back over to the other truck. There was a barn situated off to the side of the scene that interested me. I really wanted to get that barn in a composition, but wasn't really sure how to go about doing it. There were a lot of vehicles around the base of the barn, and most of them really didn't fit with the story that I was trying to tell. The one Chevy was in a decent place to tie in with the barn, but I had to be really careful with the composition because I was using the cab of the Chevy to obscure a Geo Tracker, and a newer Ford Pickup. There was also a red Firebird in the field of view. I was able to block them all with the cab of the truck and still have the barn make sense in the composition. When I got home and started to edit this one, I wasn't really liking how the color image was working out, so I decided to see how it looked without the color. When I made the conversion, I could see a great deal of potential and adjusted the tonal relationships until I came upon this image. I wasn't positive I liked it, so I asked Toni what she thought. She liked it, and since she is the monochrome expert between us, I went with her opinion. After this part of the shoot was over, I decided that I had done pretty much all that I could do with this truck. I had tried to work some isolations out, but with the weeds in the way, I didn't like how they were looking. I didn't want to wear out my welcome either, so I opted to load things back up in the truck and continue on my explorations. At least I was feeling a little better about how the trek was going at this point. I was pretty sure that I had something usable from this set of pictures. My happiness started to fade over the next two hours of driving around. I think by this time, I was in the area of Mouth of Wilson, VA. The sky was starting to clear which was what it was supposed to have done many hours before. It was now getting close to noon and with the clouds breaking up, the lighting was getting less and less flattering on the landscape. I had pretty much given up at this point and set the GPS for home. Of course, I opted for the back roads as my route just on the off chance I could see something interesting. Well, that actually happened. As I was driving down one of the back roads, I came upon this farm with a pair of barns situated at the base of a hill. The rolling landscape was rather interesting, and to top it all off, the clouds were really nice looking overhead. I made the decision to pull off on the shoulder and get set up. Once again, I was going to have to shoot this from the road since there was a gate and fence. Not wanting to loose the clouds, I didn't bother finding the property owner's house. I was hoping that they would come out and ask me what I was doing so I could ask to go in, but that didn't happen. In order to get the sky included in my compositions, I chose to go for the moderate zoom of the 24-70mm lens once again. I added the Color Combo Polarizer as well. The exposure was pretty straightforward, so I didn't need anything else to capture the image. I shot many different compositions from different locations behind the fence. Some of these compositions were dictated by the clouds, and others by the way the light was hitting the barn and mountains. As I was getting in a nice routine of framing images, I realized that the clouds were all dissipating in the sky. Without the clouds, I really had nothing at all to make this composition pop, so when I realized that the clouds were gone, I packed up and got back on my route to the house. About an hour later, I was nearing the NC line and on familiar roads. I happened to pass a barn that I remembered from last week and it caught my eye. The difference was this time the sky was looking fantastic above it. The blues were really deep, and the clouds bright white. I decided that I would give this barn a shot or two since I had time and the conditions were really good considering it was about 1pm. I grabbed my camera with the well used 24-70mm lens and added that Color Combo Polarizer once again. I set the tripod up right at the fence line which gave me a pretty good composition. I started to make exposures as the clouds changed their positions. While I was shooting this shot, I was already thinking about doing it as a black and white image. This is the kind of sky that I love to see in monochrome with a red filter applied to darken the blue against the white clouds. The color version was pretty good as well, but it didn't hold a candle to the monochrome image that I had previsualized before setting the camera up in the first place. Before packing up, I decided that I wanted to try a different composition from a bit further down the fence. I kept my same lens attached, and even stayed close to the same focal length (38mm with the first one, and 30mm with this one). The biggest difference is the change in location of about 60 feet to the right. This opened up the scene and really gave a lot of depth to the image. This is a more dramatic composition, but there is just something I really like about the more intimate shot of the barn in monochrome. Regardless, both of these images ranked among my favorites from the day which seems to be how I do things these days. I wait until I have given up and then my best work happens. I had shot 97 images throughout the day which was pretty good considering the terrible weather that I started out with. I knew that many of them from the farm in Independence would get tossed since the sky changed midway through the session. The first half images were tossed just on that one criteria. I was happy with the seven images that I had decided to keep, even though it wasn't as many as I was hoping for considering the investment in time for the day. As I was exporting them for resizing and watermarking I looked at two images from the farm in Independence and wondered about switching the monochrome/color format on them. 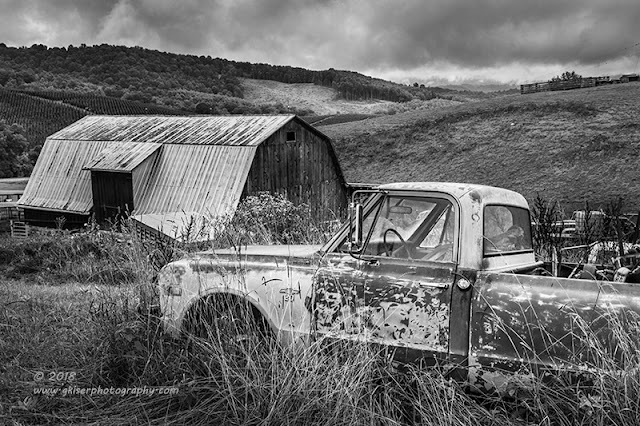 The first one that I worked with was the final image of the Chevy and barn. I hadn't like it in color the way the processing was turning out so I had converted it to monochrome. Part of that conversion includes adjusting the white balance, tint, and some of the contrast controls to get the tonal separation that you want. Surprisingly, these color shifts that I made while in black and white actually really improved the appearance of the image. I can say now that I have processed a color image while color blind. I just made a few additional tweaks to the image and I decided that I was a fan once again of the color version. Both work equally as well I think, so I kept them both and gave them different titles. The other one that I wanted to play with was the flatbed truck behind the original Chevy. I still wasn't really happy with the paint color on the truck, even though it worked for the scene. I wanted to see what would happen if the image was stripped of color. The initial conversion looked very promising indeed. I started to work on the sky a bit more, and changed some of the tonal relationships in the image. In the end, I found that this image had a lot more visual tension and drama than the color one. However, I still liked both of them equally as well, for different reasons. I felt that this one also deserved to stand on its own with its own title. At the end of the day, I ended up with nine new images in my collection and these are nine that I am very happy with overall. I'm still very much a fan of Virginia and will be making a return trip out there again to do some more exploring at some point in the future. After spending the week working on my webinar presentation for Singh-Ray which is dealing with photographing the derelict and decaying, I was fully in the mood to capture some rust and rural scenes. The weather was a little uncertain for the weekend, but it was looking like Saturday was going to be my better day when it came to clouds in the sky. I had thought about trying to get a sunrise out of the day, but looking at the sunrise forecast the color was going to be non-existent. That meant I could sleep a bit later. The only question was, where to go on this trip? A few years ago, I had found myself in Sparta, NC, after a tip from a fellow photographer. There is a great little roadside yard art display with a ton of tractors, and this one really nice GMC truck. I remember having a great time with it last time, although it was in the winter and I was standing in a good deal of slush to get the pictures. The green trees really should change the look of the compositions here. This was going to be my starting point for the day. I say starting point because I always have a first picture in mind when I head out, and then I start to explore from there. Since I don't spend a lot of time in the area of Sparta, I was looking forward to a little bit of rural exploration. I wanted to get an early start on the day, but not quite early enough to catch a sunrise. This meant I left the house around 5:30am, looking to arrive in the area around 7ish or so. The trip out there was easy enough, and it looked like the clouds were going to be cooperating with me for a change. 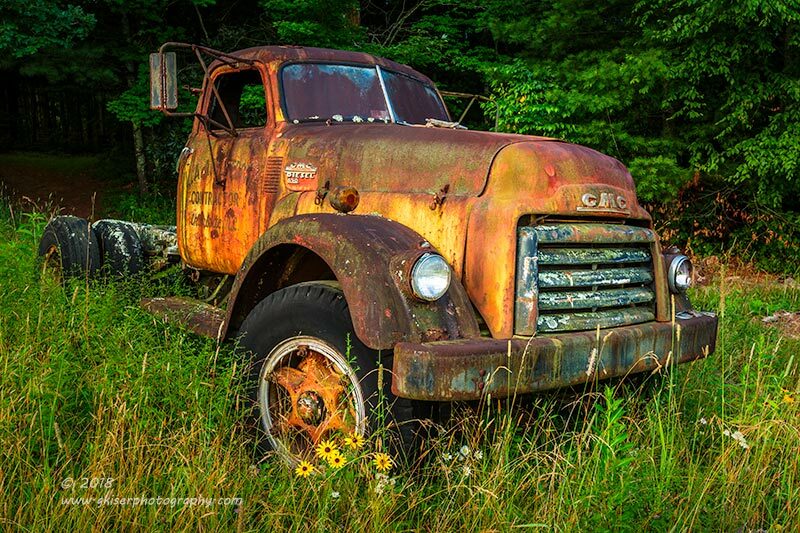 I found the old truck with no problems and saw that it was still pretty much as I had left it several years ago. The sun was just now starting to hit the side of the truck, so the lighting should be pretty good for what I was wanting. I started out with my 16-35mm lens for a change. I wanted to accentuate the cab while visually reducing the impact of the rear frame and dual wheels. Of course, I added my Singh-Ray Color Combo Polarizer to really bring out the colors in the patina and increase the contrast of the scene. One of the first shots of the day turned out to be keeper which was pretty cool. 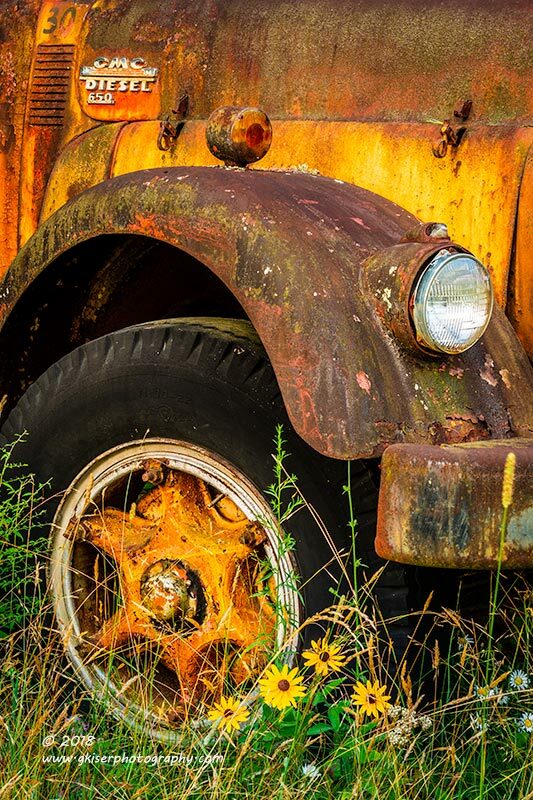 One of the aspects of this old truck that I love is the patina. 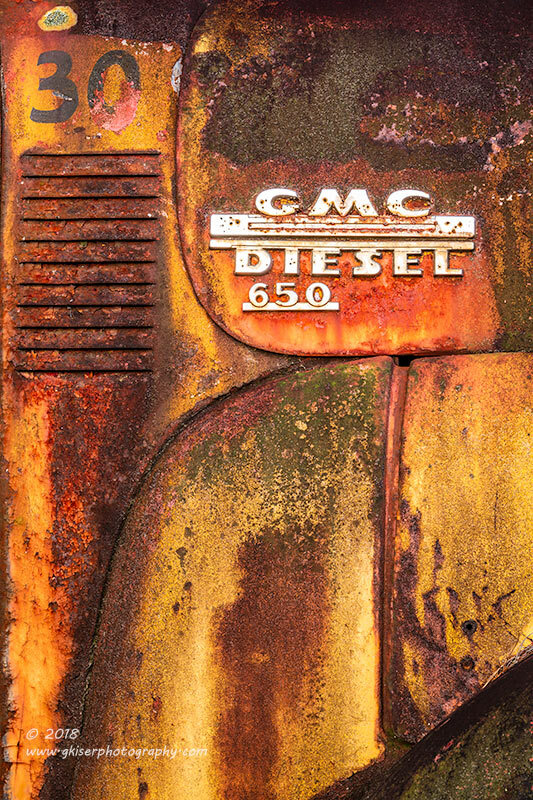 There is so much texture in the rust and the colors are amazing. Something that I started doing a little bit the last time I was here was shooting isolations on the truck. I have gotten a bit better at it over the years and was all set to work some more intimate patina shots today. I decided that I needed a different tool to make that work so I swapped over to my 70-200mm lens and kept the polarizer attached to it. At this point, I was like a sniper picking bits and pieces of the truck out as subjects. The chrome emblems on the hood really caught my eye since the bright color really contrasted with the rust that surrounded it. The bit of pitting in the chrome pulled it all together. There was a vent in the cowl of the truck that added to the visual impact with the repeating horizontal lines, and I used the vertical lines of the hood, and fender to balance out the composition. I'm telling you, this truck is fascinating to work with, and every time I have photographed it, I have been quite fortunate and gotten many good images. There is just so much character to find, and every inch of this truck is part of the story behind it. The textures that it offers is nothing short of amazing though, and probably my favorite aspect of the whole truck. 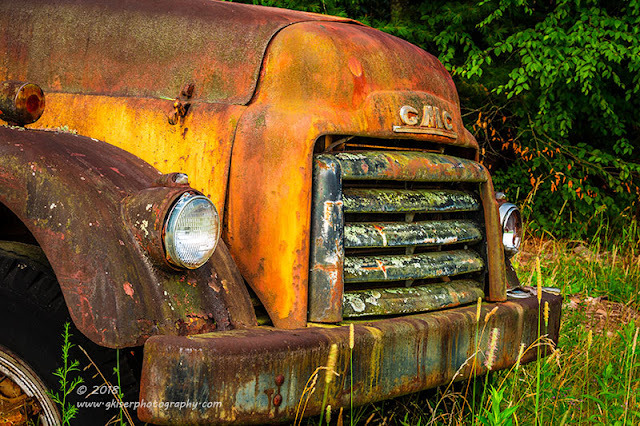 The grill of this old truck has always caught my attention, but it was a little blah when photographed straight on. I tried that not only this time, but the previous time. It just seemed to lack something in the translation and I have yet to be happy with a straight on shot of the front of this truck. However, when I moved over to the side and started to frame up a composition from here, the grill started to make sense. It was no longer two dimensional, it had depth and life, and was rather impressive without being overbearing. 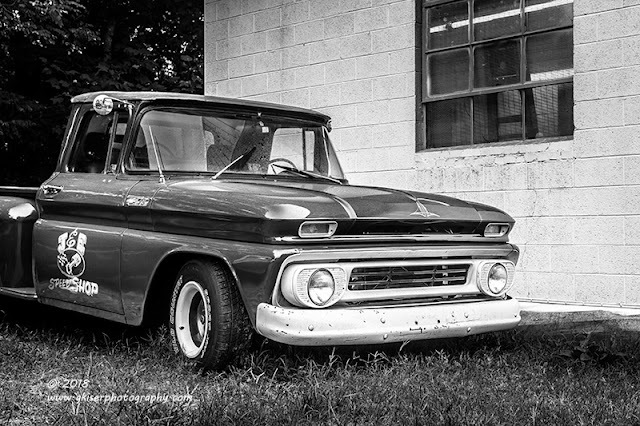 The patina detail on the bumper even added to the composition, giving a strong vertical aspect to compliment the horizontal slats of the grill. The greenery was a nice frame to the whole image and the one bit of dead leaves in the background helps to pull it all together. For a simple image, there is a lot to look at here. While I was paying attention to the front of the truck, I really wanted to do something with the flowers that were right beside the front wheel. I had included them in the overall shot, but they were just too perfect sitting where they were to ignore up close. I liked the grill shot that I had just done, but the flowers would not work with that composition. They were much too related to the wheel. Hmm, I could work with that. I decided to focus on the wheel with the flowers framing the rim. The fender would frame the tire, and the image would be bounded by a bumper corner, headlight, marker light, and the chrome emblem. This composition seemed to really flow, and it had a softer side to it thanks to the flowers. Even though this is just a small section of the truck, the sense of power that is conveyed here is unmistakable and the colors are rather dynamic which makes this an interesting image. Speaking of the chrome emblem, the sun was peeking out from behind a cloud and the truck was getting bathed in a warm glow. 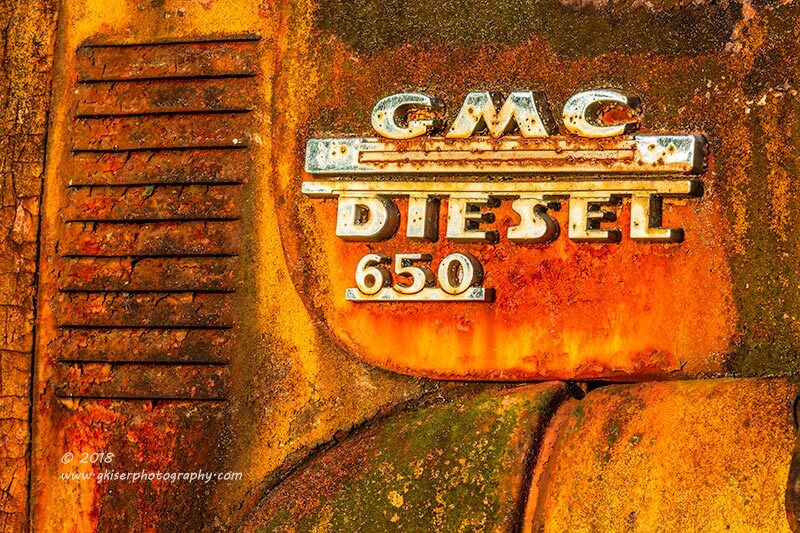 The rust was absolutely on fire on the side of the truck. 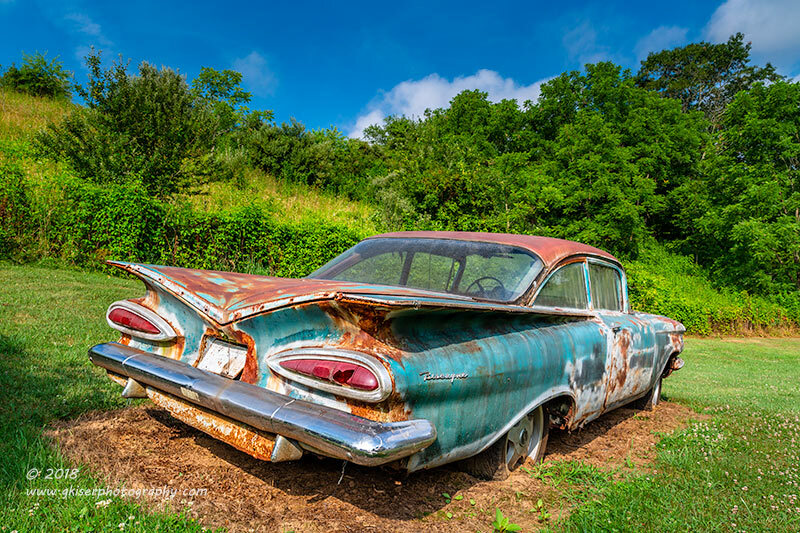 I reacted quickly and got into position for another composition on the side of the hood. This time, I was looking for a collection of lines, I wanted to reduce the composition down to the emblem, and the vent with just enough of the fender to balance out the composition. I framed the image very tight, at about 160mm and waited for the sun to hit it just right before releasing the shutter. When I saw the image come up on the LCD, I knew I had a winner. Even with the contrast and saturation reduced, there was color galore and the histogram showed a perfect exposure. This one was going to turn out really good I thought, and I was right! I tried a few other things, and even tried shooting into the cab through the open window, but the compositions were not as strong as what I had already done. I looked on the other side to see if I was missing anything interesting. There just was nothing really to keep me here much longer. With the morning sun climbing into the sky, I wanted to continue on my journey to find some more rural subjects before the light got too harsh. I packed up my gear and got into the truck for a destination not quite known to me. I drove around Sparta, and into Piney Grove before getting really lost. I was heading in a Northwesterly direction knowing that eventually I would come into Virginia. Of course, that did happen rather quickly as I was at the top portion of NC to start with. I believe I was entering Grayson County and found that there were a lot of great potential subjects, but power lines and bad lighting were getting the best of me. I just won't even stop if I don't see a pretty good potential picture. I was getting deeper and deeper into Virginia and was starting to get a tad discouraged as the morning was marching on quickly. Doing this type of exploring, I have gotten used to a whole lot of nothing punctuated with a quick blast of "Oh Boy!!!" That was just what happened as I was traveling down one of the state roads. I saw a barn set just off of the road with no power lines. 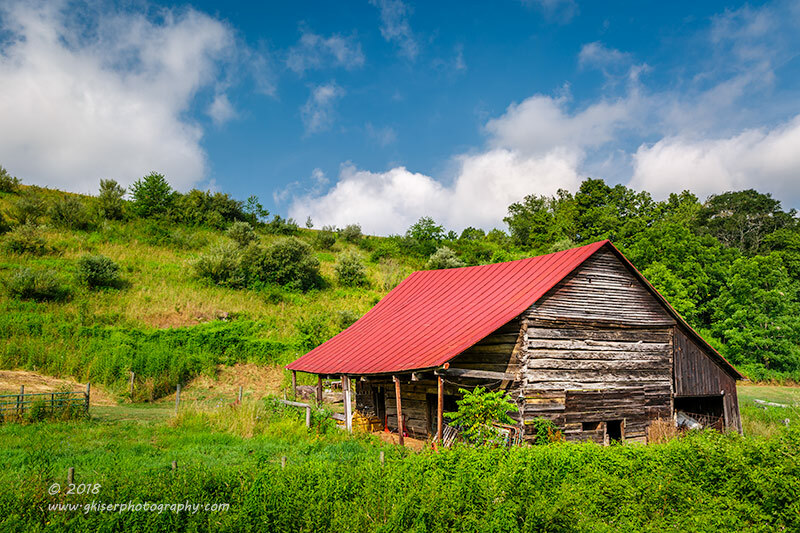 It had this amazing red roof and the barn wood was perfectly aged. 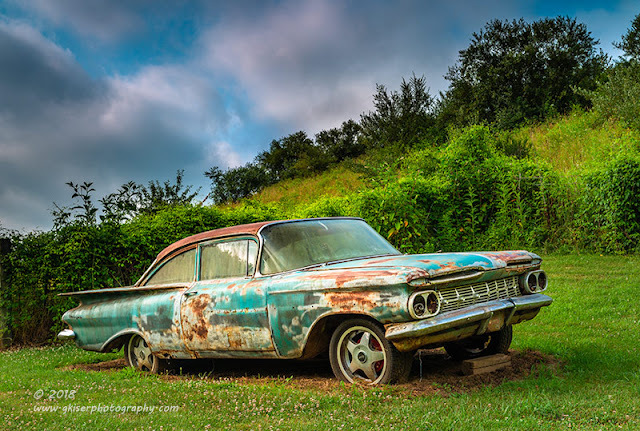 As I was passing it by, I caught sight of a Chevy Biscayne all by itself next to the hill. I even stopped in the middle of the road for a brief second and took it all in. The car had some aftermarket wheels straight from the 90's on it, but other than that it looked perfect to me. I got turned around and slowly came back. 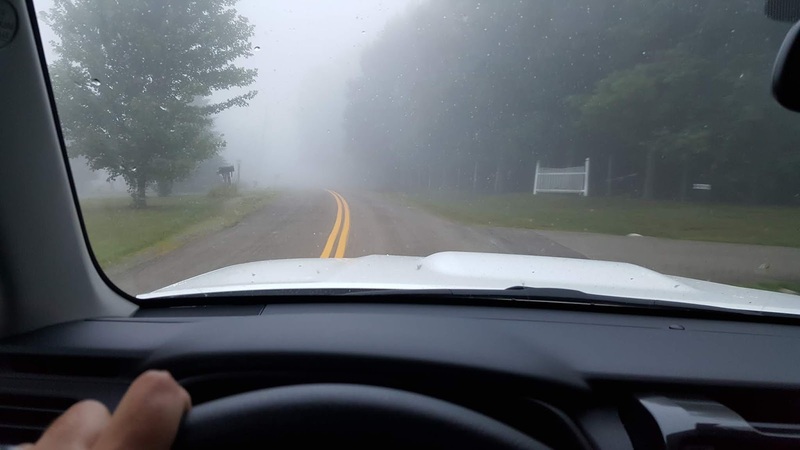 I could get the barn from the road, but the car was really going to need some permission to go that deep in. Looking at the properties around it, I was able to determine that the house across the street was probably the one associated with the barn. I parked in the driveway to the barn and walked over to the house. I picked a door that looked like a guest entry and and knocked. I could hear sounds inside so I was pretty sure that somebody was home. As I was looking around, I saw a dog coming out from one of the structures on the property beadlocked on me. He didn't look fierce or upset, so I just held my hand out and spoke with him. He came over and sniffed and then licked my hand. At that point, I knew I was in good shape with the dog. I rubbed his head for a minute and made friends. He even sat down right next to me while I waited at the door. I could still hear sounds, but the door wasn't opening. I decided it was time to move to the next door that looked like it went to a sun room. As I got close, I raised my hand to knock on the door as the door was opening. The resident came out looking down at the ground. I knew he did not know I was there, and I didn't want to scare him with my fist up in the air. I quickly raised both hands and said "don't let me scare you." He looked up startled but calmed quickly and we introduced ourselves. He confirmed that the barn was his property and even volunteered about 100 acres of land for me to photograph on. I have yet to do a video on the ND Grads for Singh-Ray, so I decided that this would be a fantastic time to do just that. I pulled out my phone and set it up to shoot video. Then I started to figure out how to make my one remaining hand be able to manipulate the filters. I bypassed some of the steps just simply because I didn't have enough hands to be able to go through all of the steps and demonstrations, but in the end I think I got the general idea out there. The sky was starting to clear at this point and the sun was hitting the car pretty hard. I really wanted to do something to highlight the wicked cool fins on the back of the car. I moved to the rear of the car and set up close to the ground. I opted for a pretty wide angle shot to really pull the attention to the lines in the back of the car. The harsh sun actually helped here by showing off the shadows deep under the fin. Without this shadow, the dramatic lines would not have been as obvious. For this shot, I was able to remove the Grad filter since the sky wasn't as bright in comparison from this angle.. I worked around the car for a bit, but surprisingly was unable to find any isolations that I really liked. The overall shots turned out so much better than any of the isolations that I did, so that is what I decided to keep from this shoot. With the sun rising, and the clouds looking different, I decided to move onto other things. I wanted to go out and shoot the barn real quick, so I grabbed my stuff and moved back out to the road. I was able to keep my 24-70mm attached based on the distance I was shooting from and I started to fine tune the composition of the barn. Now, according to the owner, this was a school originally before the civil war. After that period of time, the school was moved to the current location and reassembled as a barn. It is still in use to this day. Once I finished with the barn pictures, I made my way back across the street and worked my way to a small shed over in the corner of the property. I had seen an old Ford tractor sitting in it while talking with the property owner. 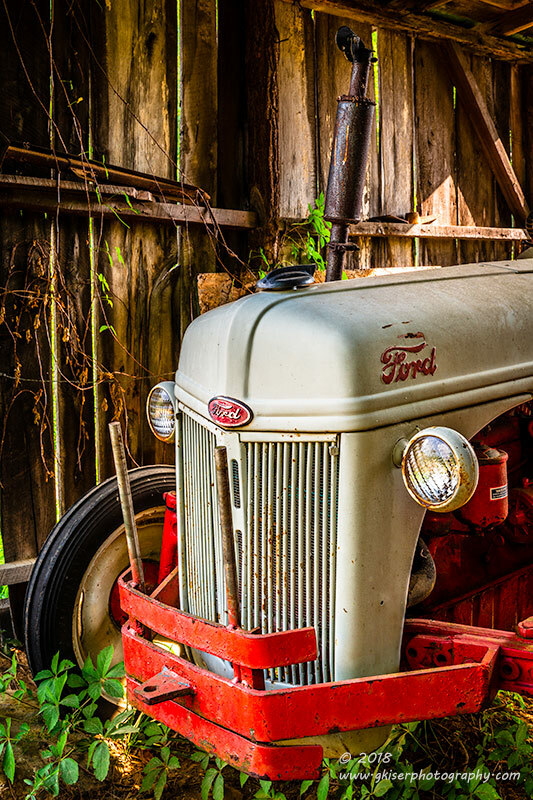 This tractor was still in use, but had a certain rustic look sitting in the shed. The lighting was not great with the back part of the tractor in the full sun and the light shining in from the rear pretty bright. The nose of the tractor was fully in the shade, and I really liked the textures of the wood siding. I decided to get a tight crop shot of the front of this tractor using my 24-70mm lens right at the frame of the entrance. The Singh-Ray polarizer helped to make the red bumper pop and to control the glare on the hood of the tractor. I tried several positions, but found that this one from about four feet off the ground worked the best out of all. These N series tractors are always a lot of fun to photograph when I'm given the opportunity. I was wishing for more compositions, but with the lighting, I was lucky to get the one that I did. It was now time to move on to the next opportunity. Having been given the overview of the property, I remembered that the owner said that the view from the top of the hill behind his house was fantastic. Since he said that I could go check it out, I decided to put on my landscape eyes and give it a go. I walked up to the top of the hill and checked things out. Yes, you could see for miles and miles in two different directions. You could make out Mount Rogers in one direction, and see into West Jefferson in the other. It took me a few minutes to really determine how best to capture this view. Looking at the sweeping views, I really wanted to take advantage of all there was to see. I swapped out my lens to bring my 16-35mm into play. I added the Color Combo Polarizer to bring out a little more contrast in the sky. The composition needed something to anchor it, and I decided on a huge tree which dominated the landscape. At the wide end of the lens, the tree was no longer as heavy in the scene and actually provided the perfect visual balance to the slope of the hill that I was on. 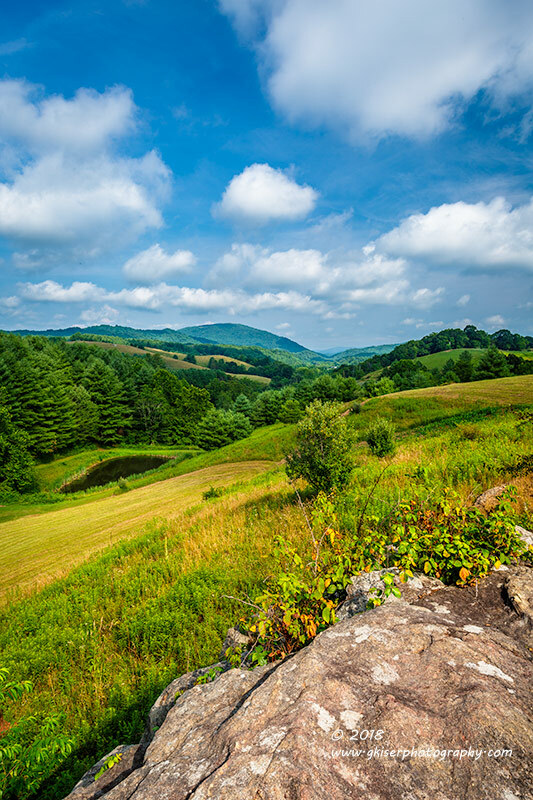 The strong diagonal helped to bring the attention to the distant mountain range and Mount Rogers in the distance. 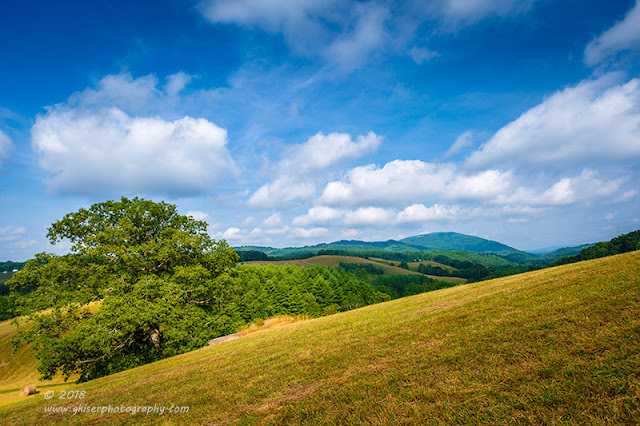 The warm rolling hills transitioned into the Blue Ridge Mountains which blended nicely with the sky. It was a simple landscape, but I thought it was an effective one. My next concept was to get right beside of the tree and do something with the small rocky outcrop that was just to the right of it. When I got over to it, I could already see a composition taking place right in front of my eyes. One of the things that immediately caught my eye was a pond in the valley below. It was just perfectly nestled at the base of the trees and helped to guide the eyes through the image. The clouds seemed to mimic the ridges in the distance as well. My initial thought was to shoot this as a sweeping landscape, but it lost the sense of meaning by doing that. When I flipped the camera on the side and recomposed, it all made perfect sense. My eyes were going exactly where I needed them to go within the frame. Just below the big tree where I was standing currently was a field with lots of hay bales scattered about. I have always enjoyed photographing hay bales and decided that I would give these a shot or two before heading back to the truck. Leaving the wide angle lens on, I started to put together some compositions. 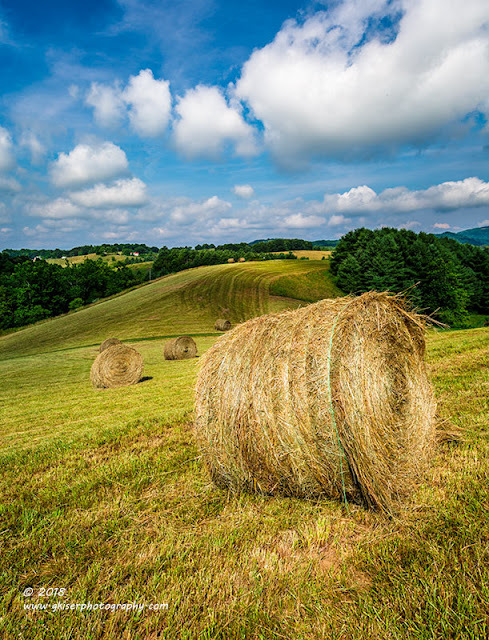 I found a few bales that would give me a leading line into the scene and got in close as to really make the bale prominent in the scene. In this picture, I was actually about 10 feet away from the first bale. I liked how my eyes moved from one bale to the next until the leading lines of the distant field pulled you the rest of the way in. The dark green trees provided a great framework for the image, and the clouds again seemed to mimic the features in the landscape with the largest hanging above the largest grove of trees. I tried this scene as a landscape shot as well, but it just didn't have the same visual impact and the eyes seemed to rove all over the image as opposed to following a course. I looked around for some other shots as well, but I was seeing nothing else that caught my eye with the current light. I went ahead and walked back out to the truck. Before loading up, I went back over to the Biscayne and shot a few more images with different light. At the time, I was thinking that these were going to turn out better, but after getting home and seeing them on the monitor, I was pleasantly surprised to see that the original ones had turned out better by far. This pretty much wrapped up my day, and it was time to get back home since it was nearing noon. I wanted to spend the second half of the day with Sierra since it was her birthday. That is why it took so long to get the images processed and the blog entry done. I didn't start it until 5am the following morning. I had shot a total of 92 images from essentially two locations which was pretty good. I was thinking it would be somewhere more in the area of 75 frames. I had estimated about ten of the images would be keepers, and I managed to make a collection of 12 shots that made the cut. It was a successful day and I was able to get my old iron, and even added a rustic scene with the barn. I even got to do some landscape work which I usually don't get to do when I'm working on rural exploration. Now, it is time to put the finishing touches on the webinar presentation, and get ready for that. It will air on Friday the 20th at 8pm. To view it, you will need to register with Singh-Ray which is free to do. Once you are registered, you will be able to view it live, and will have access to the archived recording as well. I hope to see you there! It would seem that I have been very much focused on old iron here lately, with the exception of a week at the beach. I have been away from the mountains for far too long. I had the opportunity to spend the day in the mountains today and looking at the weather, my best option was going to be waterfalls. I have a lot of options when it come to waterfalls, but since we have had a lack of rain lately I wanted to go where I stood the best chance of getting some good flow. 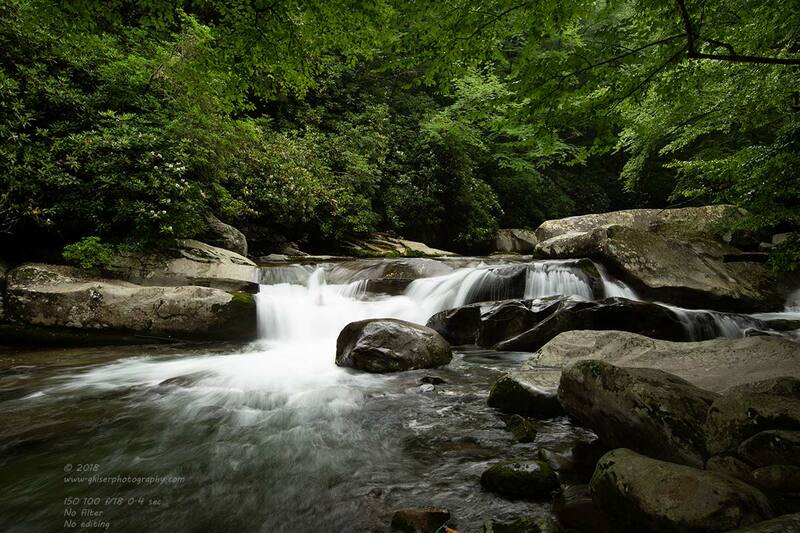 That meant going to Big Creek in the Great Smoky Mountains since it was usually unaffected by water tables. I actually had a little bit of luck the night before and there were some pretty strong storms that moved through that would more than likely boost the water levels a little bit. Since it was full on Summertime, I knew that I was going to have to get there early to get a parking spot with all the hikers and swimmers that would be there when it warmed up. This posed a slight problem since the park was a bit over three hours away from home. I was wanting to get there shortly after sunrise, around 7-7:30am. Doing the math, that meant that I was going to have to leave around 4am, which put me waking up earlier than that. I'm not a morning person by any stretch, but a photographer has to do what a photographer has to do in order to get the pictures. Somehow, I made it out of the house shortly after 4 and was on my way to the mountains. I ran into a little rain here and there as I was heading West, but I knew that rain was a potential for the day. Sometimes rainy weather makes for the best waterfall photography. I arrived at the park just before 7:30, and I was already about the 10th vehicle in the parking lot. I was really hoping that I wouldn't have to jockey for position at the different sections that I like to photograph. My goal for the day was to capture a section of Big Creek that I shot during a drought a couple of years ago. I had not been back to this particular section since that trek and really wanted to see what it looked like with water flowing. I have actually really liked this image since I shot it, and have entered it into several contests since. In order to make sure that I achieved my goal, I wasn't going to stop at places unless there was something particularly interesting to photograph differently than I had seen before. This would speed things up and make sure that I could get to the the intended location well past Mouse Creek Falls. 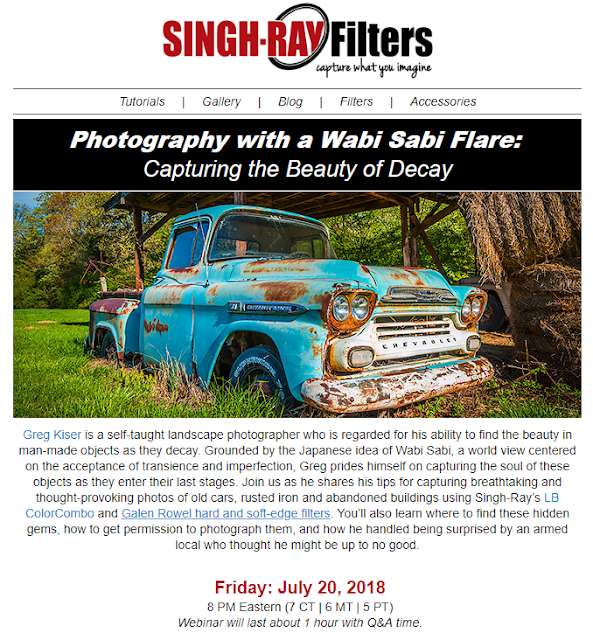 Another one of my goals which I had was to shoot some more instructional videos for Singh-Ray about how to use a polarizer for a more normal application than old cars. I wasn't sure when this was going to happen, but I went into it knowing that I would be shooting some video since the lighting was good, and relatively stable. This is what I love about shooting waterfalls on cloudy and rainy days. I can pretty much count on the light being right for long periods of time. 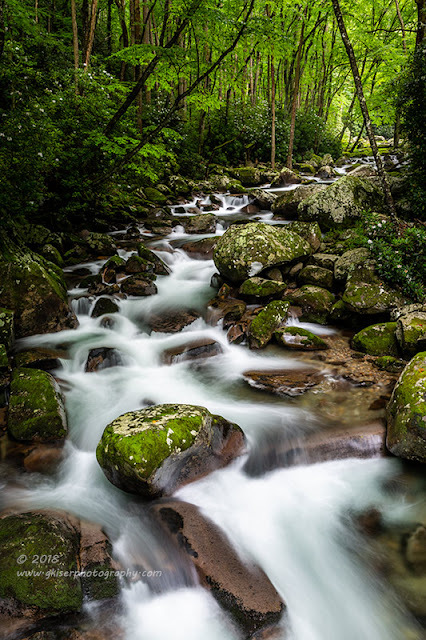 As I was working my way down the trail, I was looking over to my left where the water was flowing to see if there was anything interesting. One thing that I quickly noticed was that the brush was pretty thick this time of year and it was obscuring many of the locations that I was used to shooting. I didn't spend long trying to get a vantage point at these locations since there wasn't much different than what I had shot previously. There was one little section which I tend to shoot regularly which caught my eye once again. 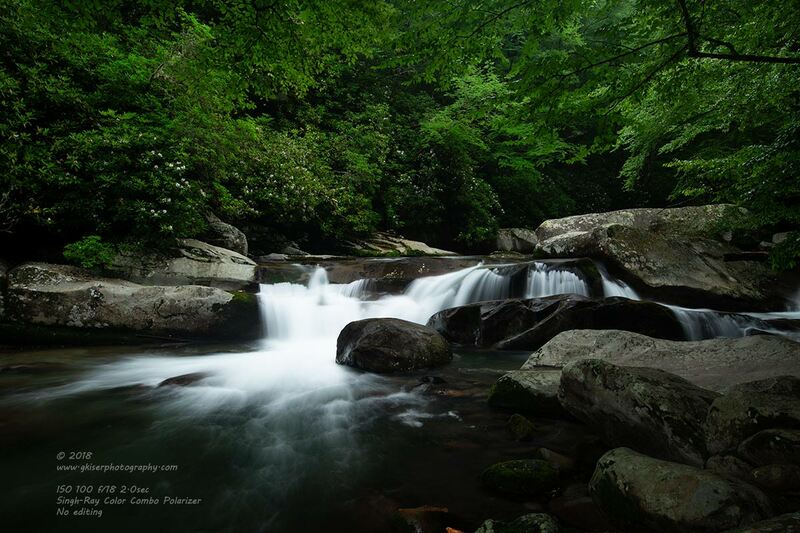 It wasn't the water this time, but the blooming Mountain Laurel just above the falls. This was worth taking a little bit of time to work with, so I worked my way down the scramble path to get into position. 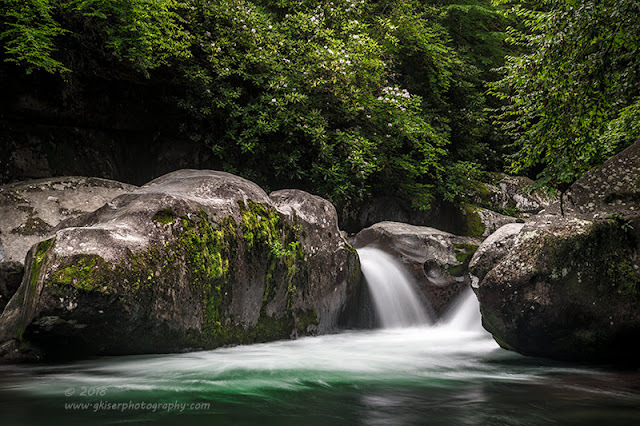 I did a little rock hopping until I found the position I wanted to use to capture the falls and the seasonal greenery behind it. As I was setting up with my 16-35mm lens, I decided to do a little comparison shooting with and without a polarizer. This might be the first time I have ever shot a waterfall without a polarizer, and honestly, I didn't like it much. It was a good comparison though, and I was able to send them to Singh-Ray. This image is straight out of the camera with no filters. I just did a proper exposure and shot it. You can see how the water shows a great deal of glare, and it lacks a little visual pop which I like in my images. This composition ultimately ended up as my opening image for this blog entry. This next image is the same composition but with the addition of the Singh-Ray Color Combo Polarizer that I use in the majority of my photography. You can immediately tell the difference in the water, and a lot more contrast has been added. 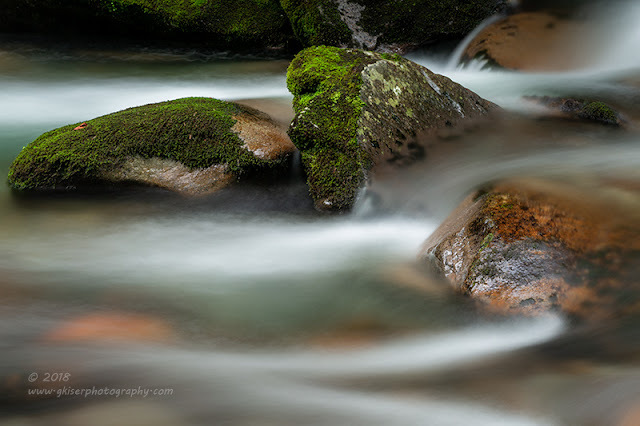 Just the addition of the polarizer lengthened the shutter speed from 0.4 seconds to a full 2 seconds to blur the water. Since I was already working without a filter, I figured that this would be the best time to shoot the video that I had been planning on. I went ahead and got everything prepped for easy of manipulation with only one hand and got my cell phone out to record the video. After doing some of the behind the scenes work that I had planned on doing, it was time to pack up and move to my next location. There were several along the trail that I really enjoy working with but this time, they really didn't stand out all that much to me. The next time I exited the trail was at Midnight Hole which I really didn't want to stop at since I have two really good pictures of that waterfall already. However, when I walked passed it, I could see that there was some really good color to the water. It was worth a stop to see what I could do with it. I worked the scene from a distance away and gradually moved in closer. 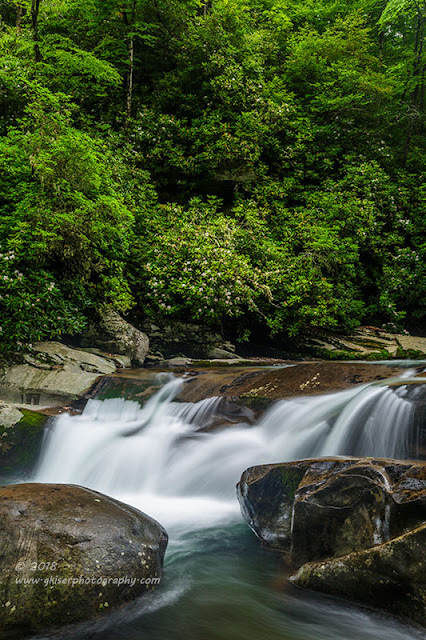 For this waterfall, I used my 24-70mm lens with the polarizer attached. The ones from a distance were fair, but nothing all that special. As I got in close to the tree with the exposed roots, I ran into a problem with a tree that had fallen and was floating on the water. This was just too much of a visual distraction and I had to abandon that composition relatively quickly. I composed a tight crop on the falls and included the blooming tree above it for a touch of seasonal flare. As I was shooting this series, the air was thick with the perfume of Summer. 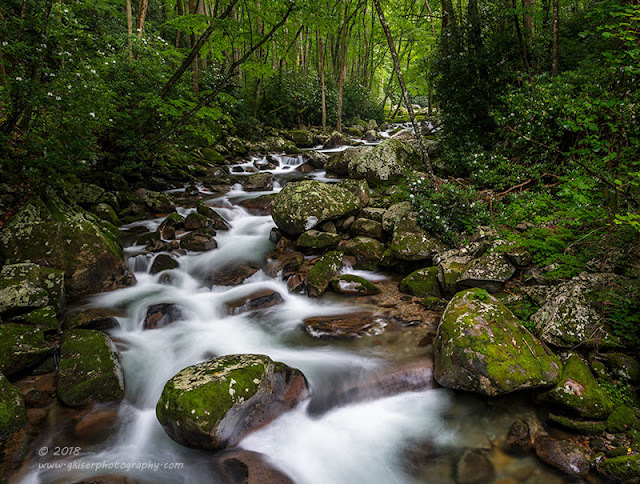 With all of the moisture around and the Mountain Laurel in full bloom, it just smelled like Summer in the mountains. When I was titling this piece, those memories came right back to me, and it pretty much named itself. 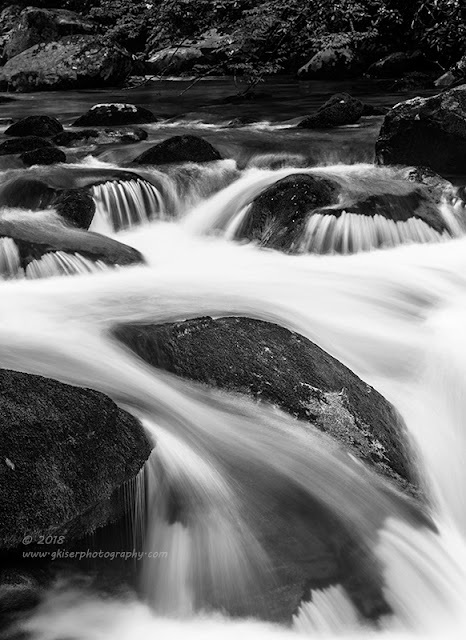 I did a little work with the small cascades in the stream over to the side, but I wasn't able to find a composition that really worked. There was just no organization among the rocks. I needed something for the eyes to follow. Since I Wasn't having much luck, I went down to another section by the trail and found that the lighting was even better on the rocks. I went ahead and pulled out the camera once again, and fitted the 70-200mm lens and polarizer. I was starting to have some pretty good luck with these rocks. I could find order in the chaos with them, and was able to pick out several workable compositions. While shooting these isolations, I got the idea to do another video about how I can get a nice long shutter speed with just a polarizer attached. Video is not my specialty by any stretch, but considering I'm doing this on a cell phone while manipulating the camera I'm doing pretty good. This shows a bit about how I do these isolations, and what I'm looking for on the back of the camera. Unfortunately, I ended up not liking this particular composition on a big screen so it was trashed. However, I did do another one from the same area which turned out pretty good. When doing these intimate captures, it really is all about simplicity of composition and having something poking up above the water to give a nice visual anchor. The silky ribbons from the passing water give the visual drama to the image which makes it interesting. It didn't take long and I was tired of shooting the intimate shots and was ready to get on to the main goal which was still a good ways up the trail at this point. 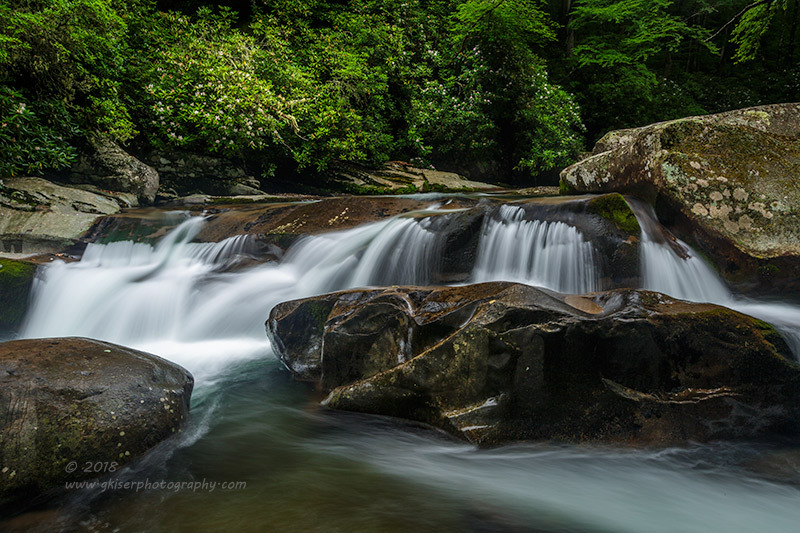 In order to get there, I chose to pass right by Mouse Creek Falls which was looking pretty good, but not spectacular. I even passed right by the bridge which overlooked some really good cascades. I thought that if I had time I would grab a few shots here on the way back, but for now, I needed to get moving. Things had changed so much with the extra greenery and increased water flow that I almost didn't recognize my spot. It also happened a good deal further up the trail that I had anticipated. When I arrived, I quickly remembered where I had been set up and made my way to that spot. I was actually pretty amazed at the difference a little water would make. I went ahead and used my 24-70mm lens with the Color Combo Polarizer. 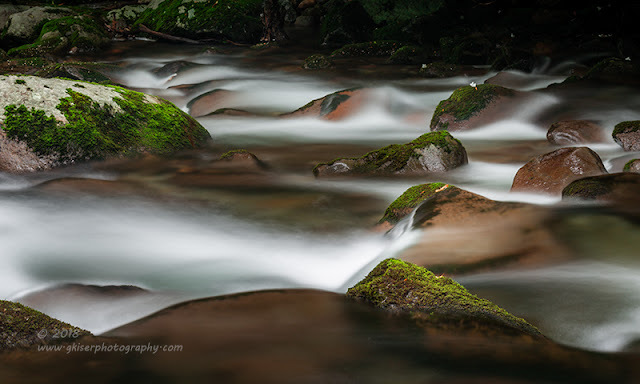 I wasn't quite happy with how the overall composition was going, so I started to shoot some isolations here showing off the full flowing water. The one that I really liked ended up getting processed as a black and white image because it lacked the visual pop it needed in color. This way, the detail in the water is very apparent, and I think it is a much stronger image this way. I did finally settle on a composition that I liked. I had to adjust from how I shot it last time because the pool at the bottom right was just too bright, and became too much of a focal point if I included too much of it. 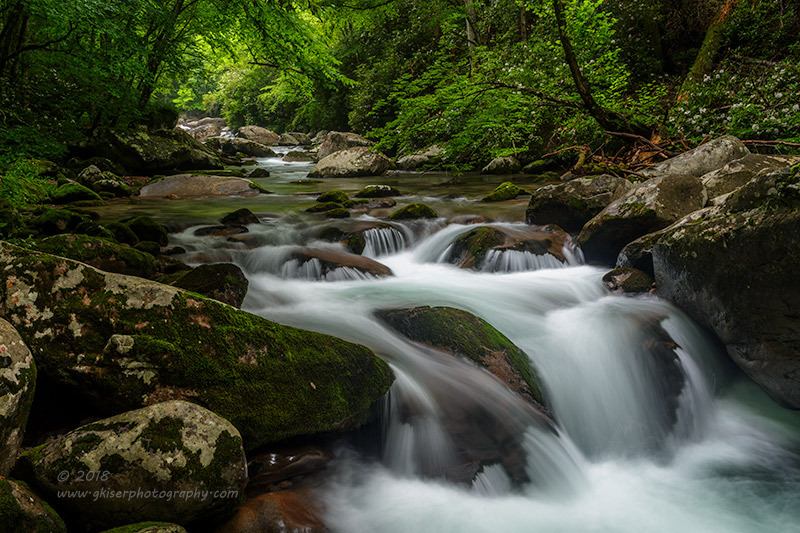 By reducing the footprint of the white water, I was able to compose a workable image of the location that shows the difference in the water. I still like the original image, and possibly better, but this one turned out quite nice as well. There is a lot to look at as you eyes work their way to the background. After about 20 minutes here, I had shot all that I cared to shoot of this location. My camera position was pretty restricted due to the rock that I had to be on, so there was only so much that I could do compositionally without falling off of the rock I was on. That was OK since I had plenty of other things that I wanted to shoot. I started to work my way back down the trail towards the bridge overlooking the creek. When I arrived, there was no longer anyone standing on the bridge which was a very good thing. You see, on these wooden bridges, any movement translates into vibrations which affect the sharpness of the image. I had the bridge to myself and took advantage of it. I shot low to minimize the perspective distortion that I was going to have from shooting this far up. Fortunately, I was able to peak the 24-70mm lens through the slats without any issues. I had to use my B+W polarizer for these shots because my Singh-Ray had gotten fogged over pretty bad on the last set and had a thick haze on it which I was unable to remove with a lens cloth in the existing humidity. 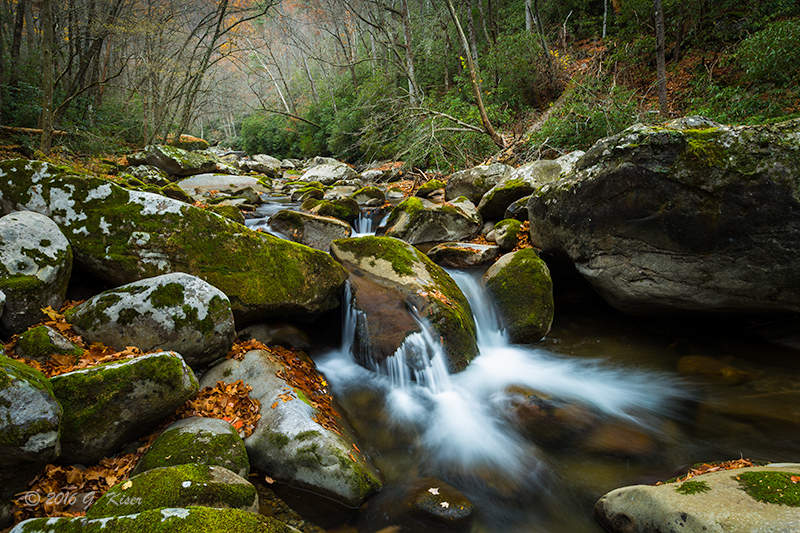 The gentle curve of the creek allowed for a great composition in both landscape and portrait orientations. When I was editing the landscape shot, I started to see it as almost a square composition. I ended up cropping pretty drastically from the right to change the feel of the image. It allowed everything to line up much better than its native aspect ratio. The portrait shot worked well as it was thanks to the two rocks in the foreground that really provide a nice visual anchor for the eyes. I would have loved to have gotten down to the water for some really dramatic shots, but there was just no way I could get down there safely. I checked a couple of different locations for other compositions but found that I had already located the best spots to shoot this from. 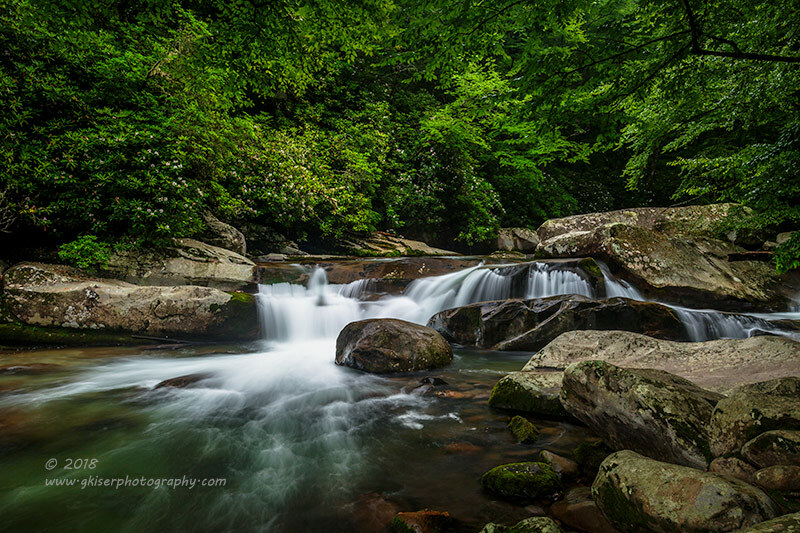 I went ahead and packed things up and got ready to head on to Mouse Creek Falls a short distance down the trail. The lighting was about the same as it had been, and I figured as long as there were no people there I would give it another try. 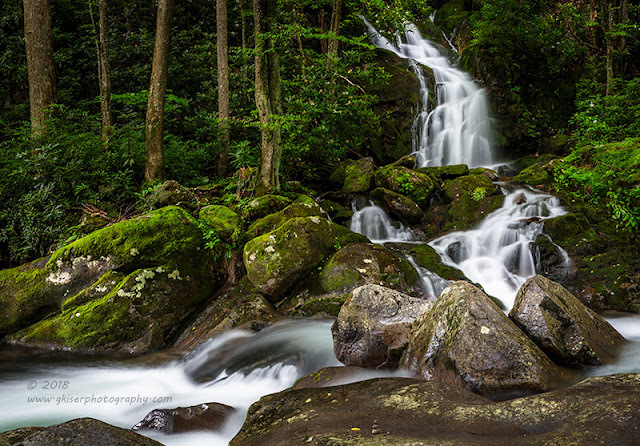 When I arrived at Mouse Creek Falls, I was very happy to find that there were no hikers to be found. I started to work my way down the scramble path to the bottom. I knew that the best composition was from about the half way point on the path, but with the low limbs near the falls with leaves on them, I needed to get down lower. Looking at the scene in front of me, I decided that while I really wanted to use the 16-35mm lens, I would be better suited with the 24-70mm which I put on the body. I added the B+W polarizer as well since I had smeared my Singh-Ray beyond use for the rest of the day. I found a couple of workable compositions before trying to get in closer. As I was swapping over to my 70-200mm lens, I had my first real run in with hikers. There were two guys coming down the scramble path to enjoy the waterfall. They asked if they would get in my way with I though was very considerate. I said that I doubted it, but I would only be another couple of minutes. They patiently waited as I got the long lens fitted with the polarizer and started to make a few images. I wasn't really happy with what I was shooting as I wasn't getting quite close enough. I thanked the hikers and said that I was finished. They actually went well out of my way to sit down and have lunch which made me feel kind of bad since they wouldn't have been in my way regardless. While I was starting to pack up, I remembered my 2x teleconverter which I carry in my bag. This piece goes between the camera body and my 70-200mm lens to make it equivalent to a 140-400mm lens. I have only used it twice before, and figured that this would be a good time to give it another try. I was very happy that I thought to give this a try. I was able to zoom into about 253mm for this image. It was just a smidge tighter than what I had been able to get with the lens alone, but it was an important compositional change. It also kept the lens at its sweet spot near the middle of the zoom range. I shot this figuring that I would convert it to a monochrome to really make the water stand out. The color version was pretty good, but there was just too much green in the image, and I wanted a higher level of contrast. The conversion to black and white worked just perfectly and I ended up with a really nice execution of the concept that I had when I switched over to the long lens in the first place. This was the last bit of pictures that I shot. When I got back to the trail, there were hikers by the dozens going up and down the trails. Many were obviously set to go swimming in addition to hiking. The clouds were also starting to part a little more than I liked. With these things going against me, and seeing that the time was after noon, it was time to head back to the truck. I had shot 123 frames during the five hours that I was in the park. That would be enough to keep me busy for most of the night once I got home. It turned out to be a pretty good day. I achieved all of my goals that I had set for myself for this trip. It was also a fantastic day to be outside. The temperatures stayed right around 70 with just a passing drizzle with the clouds. After weeks now of 90+, it was almost a Fall day in the woods. I am starting to get tired now as I have now been awake for 19.5 hours and still have a few more things to do before bed. Thanks for joining me on my hike at Big Creek!